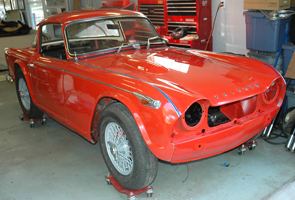 In our shop undergoing a complete cosmetic and mechanical restoration is this 1966 Triumph TR4A. Equipped with Surrey Top, Wire Wheels and Overdrive Transmission this will be a very desirable sports car. Look for a completion date of Spring 2015! 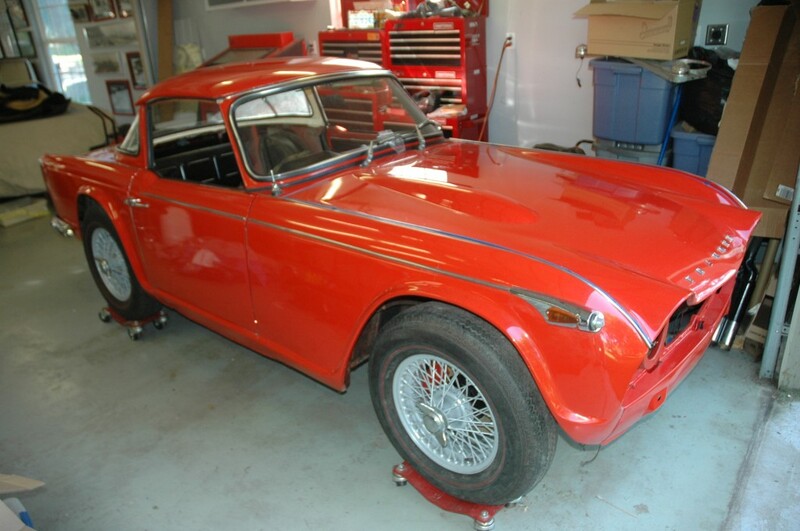 We found this highly optioned TR4A languishing in a suburban St. Louis garage in July of 2013 where it had been resting for over 20 years. After a deal was struck with the previous owner we began our standard British Sports Car 4 Step revival process: STEP 1: Get it Running STEP 2: Restore and detail the engine bay STEP 3: Repair everything that needs repair and STEP 4: Find a new happy owner. STEP 2 was where our game plan radically changed. As we were dismantling the engine bay to freshen up the bright red paint we noticed that the lower radiator hose and radiator were full of stop leak. When we removed the water pump our fears were confirmed, in an effort to fix a leaking radiator the previous owner over filled the cooling system with stop leak. 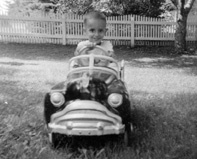 At this point we were afraid to proceed with out plan for fear of creating a Hot Running sports car and a very unhappy new owner. THE NEW GAME PLAN: With a block full of stop leak we decided to take the much longer and more expensive route of rebuilding the engine and everything else as well. In September 2013 be began the journey. We removed the engine and transmission, and we gutted the interior as well. My partner took the “roller” home to work on some chassis issues while I started on the engine teardown. 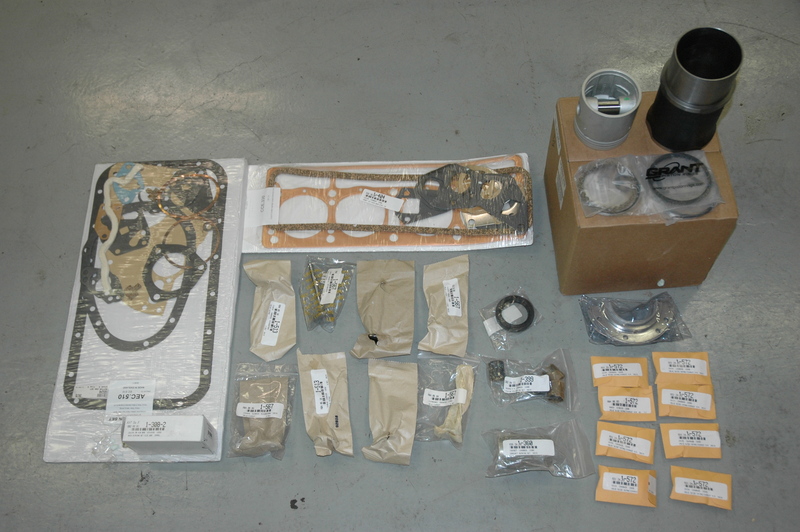 As suspected, the block was full of stop leak… now standing at the top of the “Slippery Slope” of automotive rebuild I ordered everything pictured here: Pistons, Liners, Rings, Bearings, Gasket Sets, Freeze Plugs, and other various engine pieces. 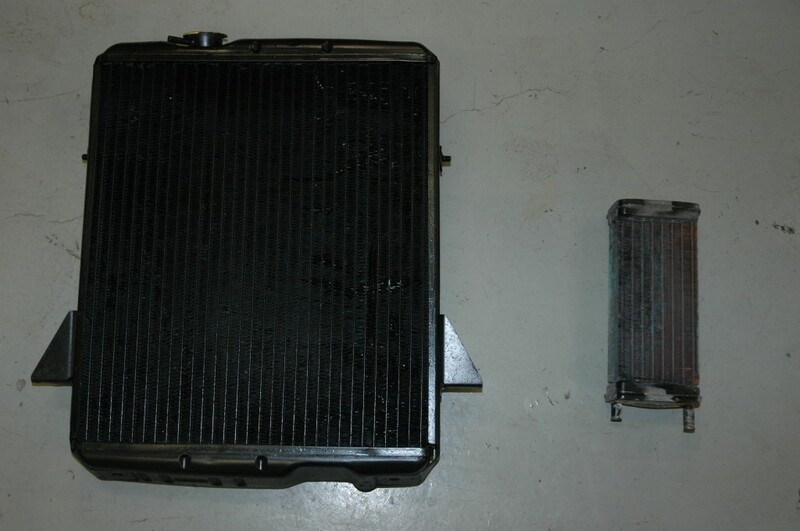 While I was on a roll I sent the radiator and the heater core out to be hot tanked, pressure checked and repaired. With the engine torn down, we sent the block, crankshaft, rods, and cylinder head out to the local machine shop to reconditioned. Surprisingly, my partner and a friend pulled the body off of the chassis to make chassis repairs easier. While he was fixing things, the frame was sanded and received a fresh coat of black paint. Front and rear brakes were rebuilt, suspension bushings were replaced, all new brake lines were installed and rear shocks were reconditioned. 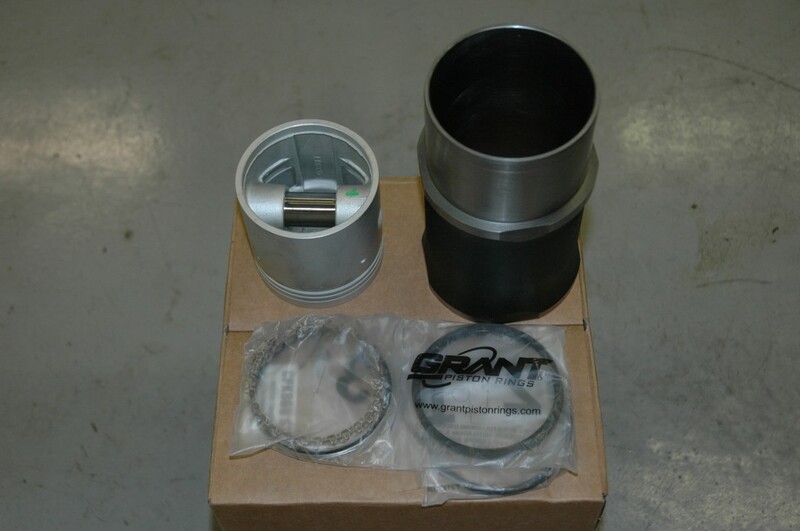 We ordered a new body mounting kit and our TR4A returned to my shop in one piece as seen below. We scuffed and degreased the engine bay and added a fresh coat of paint to the engine bay. Let the rebuild begin. 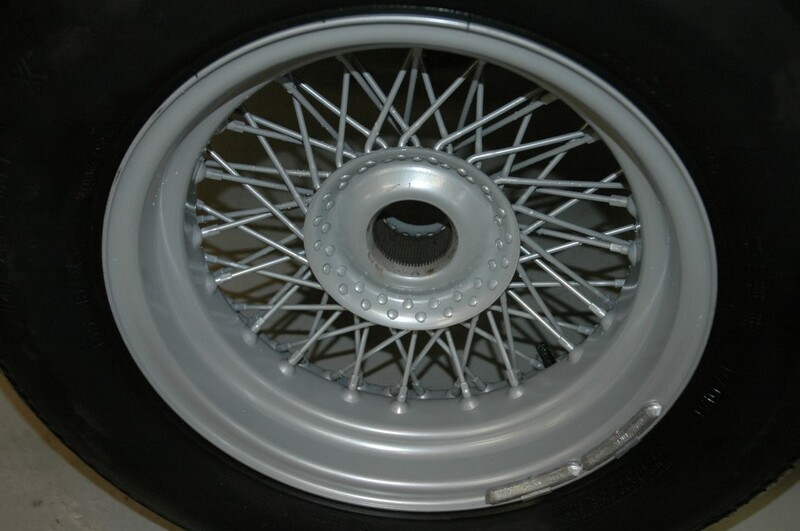 In addition, my partner had the original wire wheels media blasted and powder coated a nice stock looking shade of gray. Note the chassis details in the wheel well. While waiting for the machine shop to finish our engine pieces, we removed, cleaned, and painted the fuel tank and reconditioned the fuel sending unit as well as checked the fuel gauge for functionality. With the fuel tank reinstalled, we next reconditioned the exhaust system which appeared to have been installed new just before the car was placed into storage. The exhaust manifold was coated with ceramic coating and new studs and brass nuts installed. We ordered most the new interior pieces that we need. We removed the windshield housing and replaced the weatherstripping. With the windshield removed, we reconditioned the perfect dash pad. We also replaced the bright weatherstrip trim on windshield and rear window. 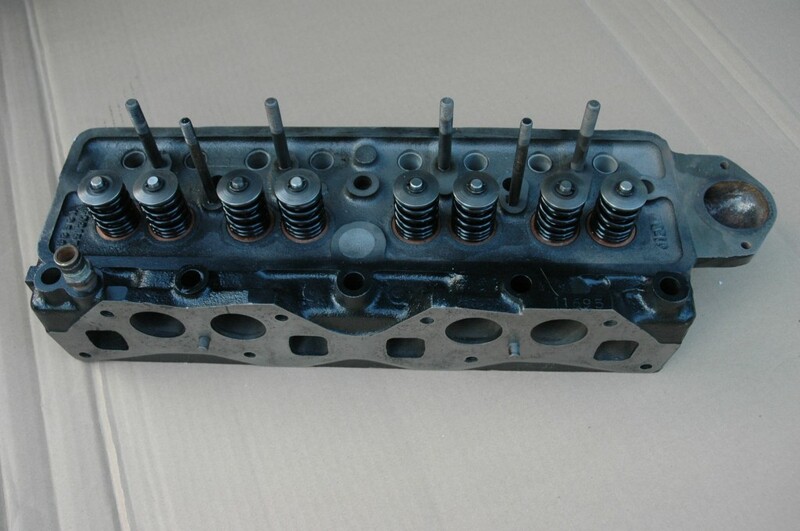 We finally received the reconditioned block, crankshaft, rods, and cylinder head from the machine shop and engine assembly began. We also cleaned, and checked the operation of the overdrive transmission and found it in good operating order. 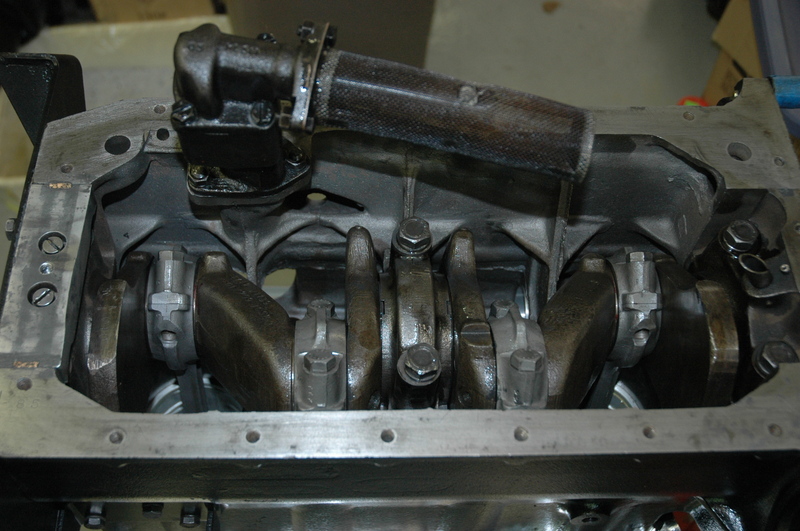 The freshly rebuilt engine was reunited with the Overdrive transmission. We reinstalled the clutch and pressure plate which appeared to have been installed new just before the car was put into storage. 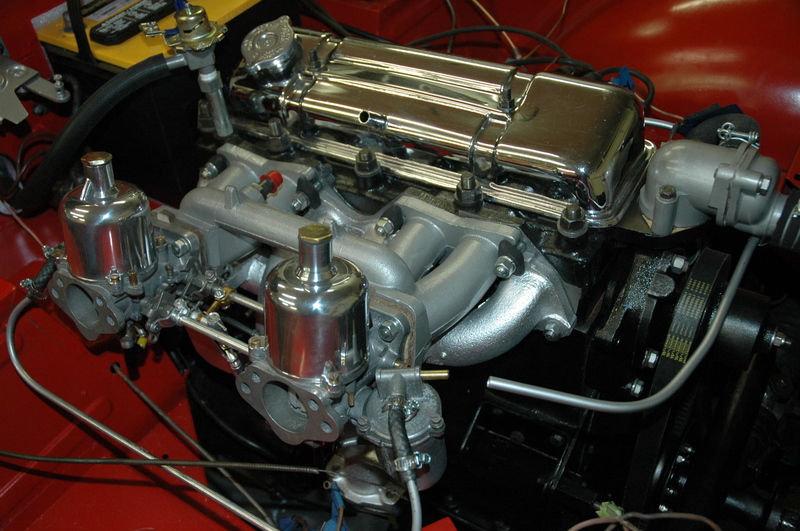 The engine and gearbox were installed in the car. 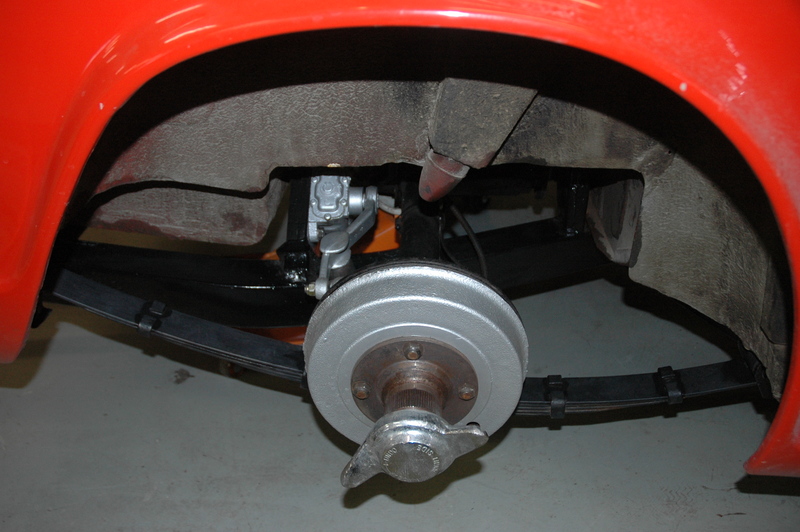 The previously removed pedal assembly was reconditioned and reinstalled in the car. Both master cylinders were rebuilt as well as the clutch slave cylinder. The clutch master cylinder was filled with hydraulic fluid, bled, and declared operational. We also removed both doors, cleaned up and re-sprayed both door jams with a fresh coat of bright red color. While we were at it we sprayed the inner door panels as well. Next the inner and outer window seals were replaced. Since we had color matched red paint in the gun, we touched up the rock chips and scuff marks on both rocker panels. This vintage sports car is really starting to take shape. On February 8 our TR4A came to life after 30+ years of hibernation. 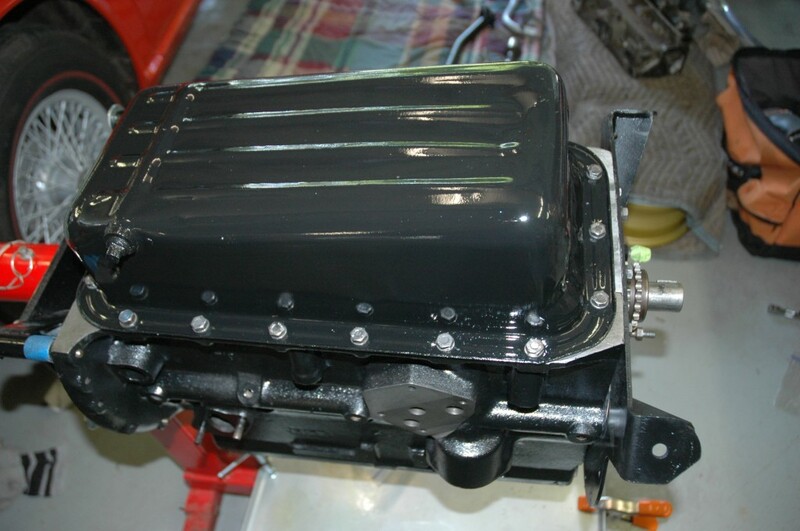 After installing the rebuilt and polished SU carburetors and throttle linkage, we reconnected the electrical system and installed the distributor and distributor base. We then filled the crankcase with oil and added a fresh filter. We connected the battery and turned the engine over confirming that we had good oil pressure. 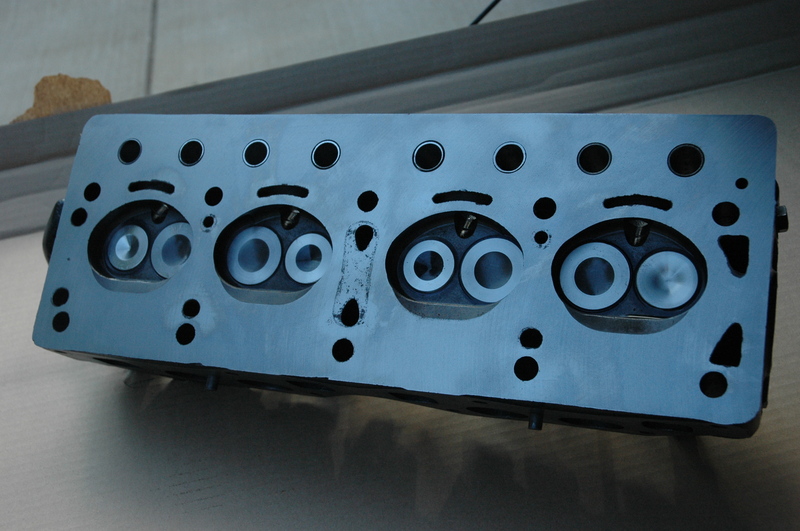 We also removed the valve cover and confirmed that we had sufficient oiling of the rocker and valve assembly. Next, we confirmed that we had spark at the plugs. Finally, we manually filled the SU float bowls with gasoline and crossed our fingers. With the choke applied, we turned the key and with a twist of the distributor the big two liter roared to like. We let it run long enough to, once again, confirm oil pressure and check for any unusual noises… there were none. I love the smell of freshly curing engine and header paint… out TR4A is alive.